PLACENCIA BELIZE OCEANFRONT INN – This is the home page for Singing Sands Inn in Maya Beach, Placencia Belize. PLACENCIA BELIZE ACCOMMODATIONS – This page lists the various accommodations available at our resort. PLACENCIA BELIZE CABANAS – This page lists information about the beachfront cabanas at Singing Sands Inn. PLACENCIA BELIZE ROOMS – This page lists information about the garden view rooms at the resort. MAYA BEACH, BELIZE RESORT – This page provides information about Singing Sands Inn. FREQUENTLY ASKED QUESTIONS – This page provides answers to the resort’s frequently asked questions. PLACENCIA COMMUNITY INVOLVEMENT – This page offers information on the resort’s community involvement and how you can assist their initiative. 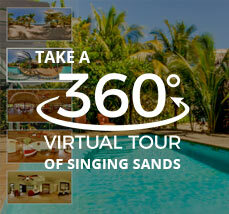 SINGING SANDS GALLERY – This page contains images of the resort. PLACENCIA BELIZE RESTAURANTS – This page offers information about the onsite restaurant – Bonefish Grille. PLACENCIA ALL-INCLUSIVE PACKAGES – This page lists the various all inclusive packages offered by Singing Sands Inn. PLACENCIA BELIZE ADVENTURE TOURS – This page lists the various adventure tours offered by Singing Sands Inn. PLACENCIA WATER ADVENTURE TOURS – This page contains information on the sea and ocean adventure tours offered by Singing Sands Inn. PLACENCIA JUNGLE ADVENTURE TOURS – This page contains information on the jungle and river adventure tours offered by Singing Sands Inn. PLACENCIA BELIZE DIVING TOURS – This page contains information on the diving tours and certification offered by Singing Sands Inn. MAYA BEACH RESORT CONTACT – This page contains the contact information for Singing Sands Inn in Maya Beach, Placencia. SINGING SANDS INN TERMS AND POLICES – This page contains the terms and policies of the resort.